miDVD Pro has had a price drop of 50%. It's now $9.99US! We've decided to drop the price of miDVD Pro to see how it sells at a lower price. miDVD Pro isn't the best selling DVD burner on the Mac App Store yet, so we're giving it a push along to make it more affordable to more people. We've tried every DVD burner on the Mac App Store and while we're obviously biased towards our own stuff, miDVD Pro is definitely the easiest burner to use out there, all while producing top quality results. Give miDVD Pro a go today and see what we mean! The Mac App Store version of miDVD Pro has no trial option, but our Shedworx version does, so give that a go for free to try out everything except actually burning the disk. HD Quick Look is now FREE! 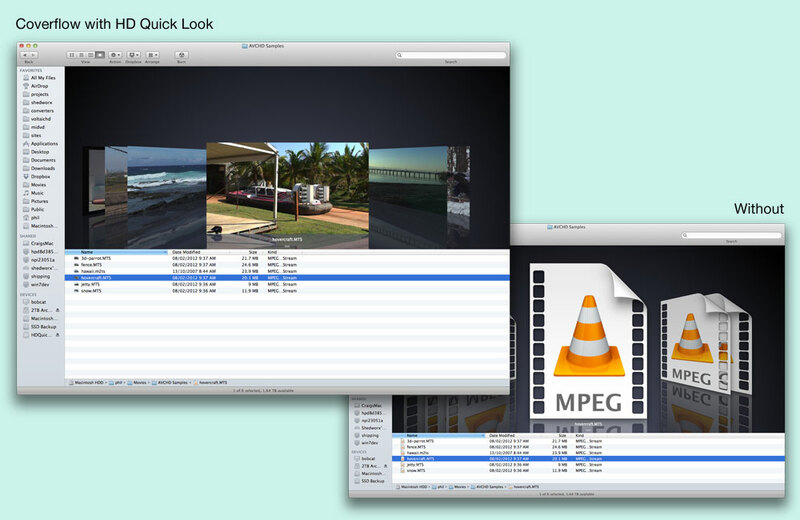 HD Quick Look lets you see a thumbnail preview of any AVCHD movie file, right inside Finder. The activation process for HD Quick Look under Mountain Lion has been broken by the new way Mountain Lion works, so rather than just drop HD Quick Look, we've decided to make it free for everyone! You can download it now for free and put it on any Mac running OS X 10.7 or later. Loops is the fun, safe and easy way to share photos with people you trust, and is available now for the iPhone, iPad and Mac. Loops for Mac has just been approved by Apple and is now available on the Mac App Store. Download Loops for iPhone and iPad from the iTunes App Store and download Loops for Mac from the Mac App Store. The best bit - they're all FREE! Loops for the iPhone and iPad has been out for a couple of weeks already, and Loops for Mac really completes the Loops experience. Use Loops for Mac to import other photos into your Loop and easily do bulk exports of Loops photos. We hope you enjoy Loops! Version 1.0.1 for the iPhone and iPad is now live on the App Store. This is a follow-up bug fix release where we've fixed a bunch of minor bugs that we encountered when using Loops for ourselves on a extended scale. No new features in this one, but lots of little improvements that we're sure you will like. We're coming to MacWorld! Again! We're all set and heading to MacWorld in chilly San Francisco in a few days time. 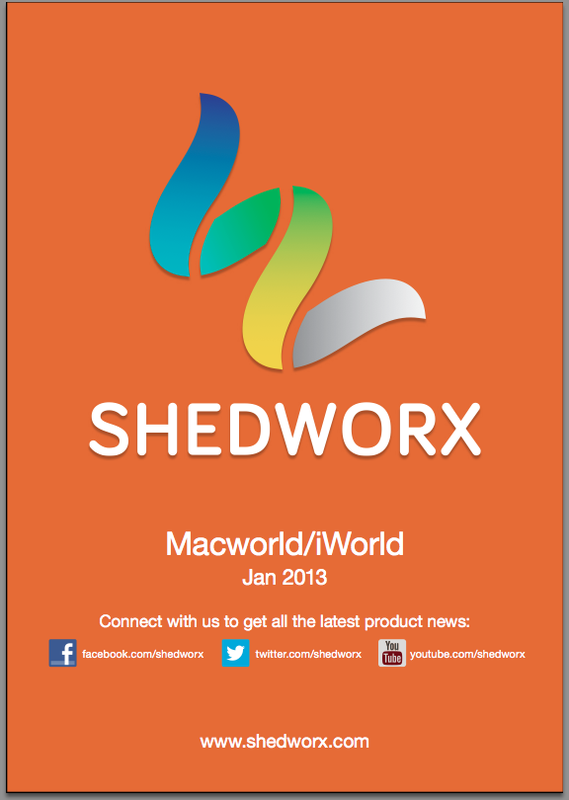 Shedworx will be in booth 1010, on the right hand side of the Expo hall, near Appalooza. Its been two years since we were at MacWorld and a lot has changed for us in that time. The biggest thing for us has been Smart Converter. Smart Converter is the number one free video converter for the Mac worldwide and Smart Converter Pro is the top rated, most popular and highest grossing video converter on the Mac App Store. Through Smart Converter and Smart Converter Pro, Shedworx software is now on a significant percentage of all Macs out there. This means a huge number of people use our stuff, and we can't wait to talk to people about it. If you're in the Bay area, we'd love to see you down at MacWorld. As part of our booth package we have an almost unlimited number of Expo passes to hand out, so if you want to save $25 on the door charge, drop us a line at support@shedworx.com and we'll have a pass waiting for you at the door. 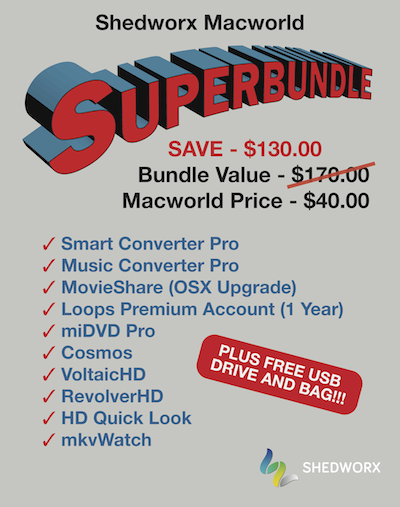 Among other things, we will be selling the MacWorld SUPERBUNDLE! All of our apps in one super bundle for $40 - a discount of 80%, available only on the Expo show floor. For those who can make it to MacWorld, we can't wait to see you there. For those who can't, stay tuned, we'll have our MacWorld post and photos up real soon!